Brittany and I met during a "family shoot day" when our husbands were in the same unit. From that point on we were basically each other's POC whenever something went crazy or wrong while we were stationed at Carson. Brittany and I are different in many ways. To start, she is about 1000% nicer than me and is probably the perfect person to teach high school and middle school. She can run half marathons while I can barely run an under 10 minute mile. She has handled two crazy deployments in a way that is awe inspiring. Although we are at different posts now, she was my first true friend I met in the military life and I am eternally grateful for that. 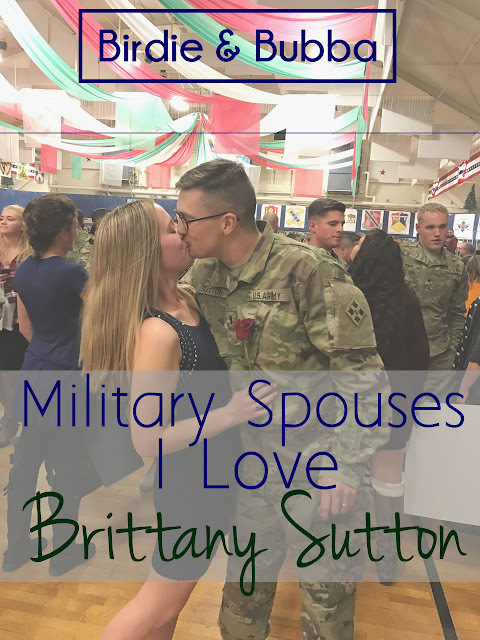 For this post, Brit chose to wrote about how she has handled two deployments and a full time job. She is a wealth of knowledge on making the most out of deployment and reaching goals while your SO is away. When you hear the word “deployment”, various things pop into your mind: where is he going, when is he going, when can I hear from him, how much time do we have left, etc. It’s all about counting down until he leaves and then counting down until he comes home. The time before is filled with stress, worry, and anxiety. You and your significant other bicker, laugh, cry, and hold on extra tight until it’s time. My husband and I have been through two deployments so far, and I think the biggest part that caught me off guard the first time, was what do I do now that he is gone? The simple answer is to continue with your life. Oddly, that is very difficult because the very fabric of your life has been turned upside-down, inside out, and all sorts of backwards. And that friends, is perfectly normal. The first thing I did was go back to work, I am a teacher and my students needed me there; and honestly, I needed the distraction. Jobs, volunteer work, hobbies, they all help you get back to a stable sense of normal. Time is only going to pass so quickly when your significant other is deployed, and it will pass much slower if you simply stay in the house and wait for a Facebook Message from them. I threw myself into work and as many activities that I could that were related with school: coaching, volunteering, you name it! My husband and I have a dog, and Max (said dog) and I walked/hiked more than I ever thought possible. I also hung out with my friends who were going through the same thing or have been there before. It is always a huge bonus to have friends that understand deployments: sometimes you need someone who will bring you wine and dinner, watch bad movies with you, and let you vent and cry it out. Another outlet for me was exercise: exercise gives you endorphins and during deployment, you need as many of those little guys that you can get. My husband and I set a goal as well: when he got back from deployment, we were going to run a half marathon together. As I was about as terrible of a runner as there could be, this seemed like a crazy goal. But running is something we had started to do together before he left, and this was also a great way to give me something else to focus on. At first, I was too busy to think of how much I missed him when I was running because I was thinking about how much running sucked! Talk about a distraction! Soon, running became very important to me. After I got over most of the suckiness that was running, I actually began to enjoy it and crave the runners high that came afterwards. It helped me think, process and just feel mentally stronger. It helped me gain a sense of strength that infused into my daily attitude and helped remind me of what I was made of. Deployments are always going to be rough in one sense or another: you’re going to need to allow yourself plenty of time to cry, watch movies, binge shows on Netflix, hide from the world and eat a crazy amount of chocolate. But, you also need to remember that you are strong, capable and that you will get through this. The best way, in my experience, is to keep busy! Find new hobbies, new exercise routines, new places to volunteer, new ways to get more involved with your job, etc. Time will pass, deployment will end, and they will come home to you; and those are the facts! So true, Brittany! Thanks for sharing! You both are strong, inspiring women and I'm glad to know you!